hot dog inspired mini sandwiches, made with pan-fried eggy crispy rice cakes and steamed lap cheong. Hot dogs! That's the theme for January's International Incident Party, hosted, as always, by the lovely Jeroxie. It's been quite the messy situation organising myself for this month's party, and I had a few hiccups along the way - but I got something done. It's certainly not the traditional hot dog - more a hot-dog-inspired canapé or pintxo re-interpreted with a strong Chinese twist. I present to you my eggy crispy rice sandwiches with lap cheong! If you're not familiar with lap cheong, it is a sweet chinese sausage, usually made of pork, and as is typical of Asian goodies, does not seem to have an official or universal English spelling. On my packet, for example, it is spelt "lup chong". Either way, have a look at my photographs and if you see something that looks like those in your local Asian grocery, you should be on the right track. I do recommend that you try these sweet, savoury, fatty bundles of deliciousness: they are fantastic in dishes such as congee and fried rice. a packet of lap cheong, plus a Lebanese cucumber I forgot to use. 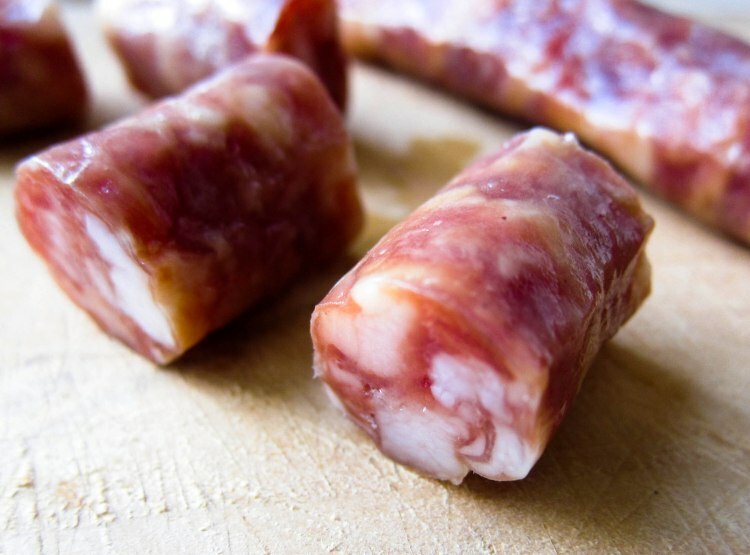 cross section shots of the sweet chinese sausage usually labelled as lap cheong or lup chong. Since lap cheong goes so well with fried rice, I decided to make eggy, crispy rice cakes to use as mini sandwiches. The concept of these, in some ways, is quite similar to my flourless potato pancake-omelettes, except instead of potatoes, rice is used here, and instead of keeping them soft and fluffy, I pan-fried them till crispy on the outside. The first thing I did was steam some rice, together with chopped up Chinese chives, red chilli, ginger, salt and pepper. I also steamed the lap cheong. I then mixed the cooked rice with egg. Finally, I assembled the mini sandwiches, which is basically just putting the crispy rice omelette-cakes together with the steamed lap cheong. I had planned to add cucumber for a cool, refreshing contrast, but I forgot. It still turned out well. 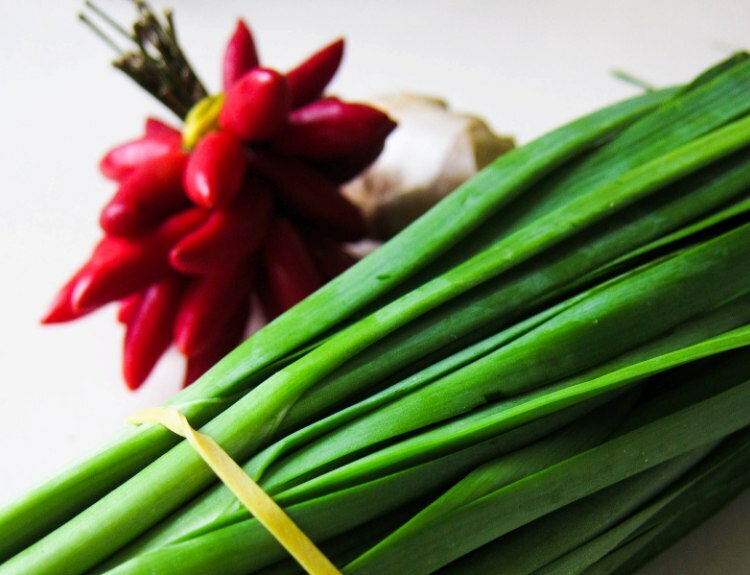 chinese chives, red chilli and ginger. the mixture of steamed rice and egg. From memory, this made about a dozen little canapés. 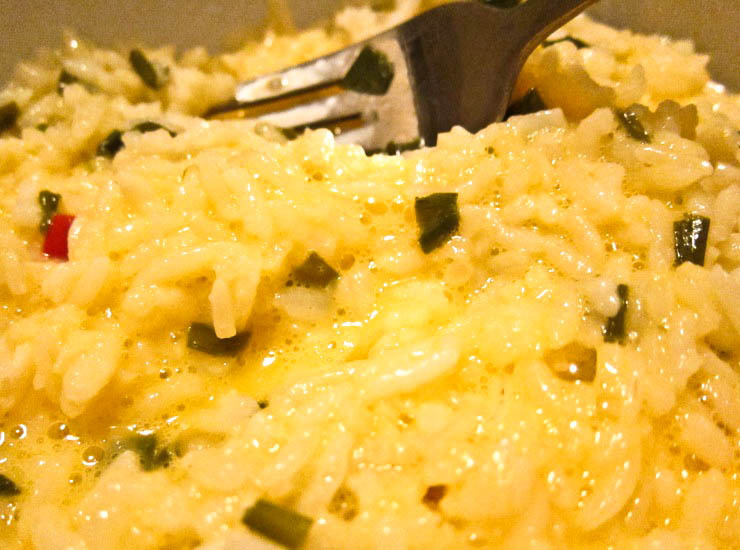 - Lightly beat the egg, then add the seasoned cooked rice and mix well. - Heat up a little oil in the frying pan and spoon the mixture into the hot pan, frying it like you would an omelette or pancake. Press the mixture down to help it fry faster and hold its shape, and cook on both sides until crispy on the outside. - Remove the crispy egg-rice omelette-pancake from the pan, and cut into little squares. 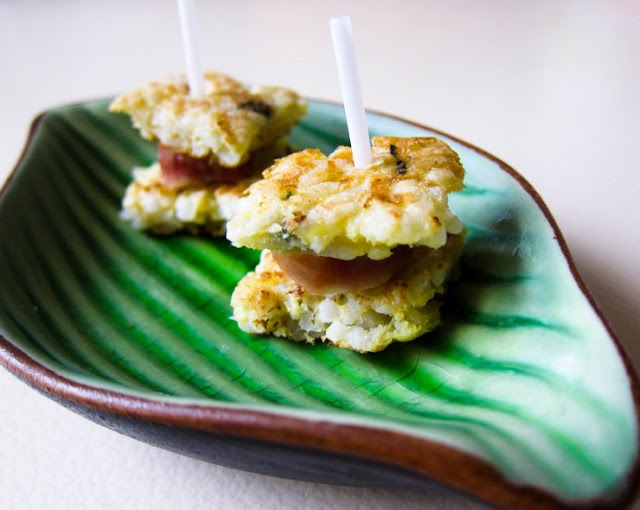 - Place the lap cheong onto one crispy rice cake, and top it with another crispy rice cake. Secure with toothpicks. If you want a higher ratio of lap cheong joy, do it open-sandwich-style and omit the crispy rice cake on top. Remember to steam an extra lap cheong in that case! - If you do use cucumber, you can incorporate them into the mini sandwiches, or serve them on the side. - Serve immediately, while they are still warm and crispy. 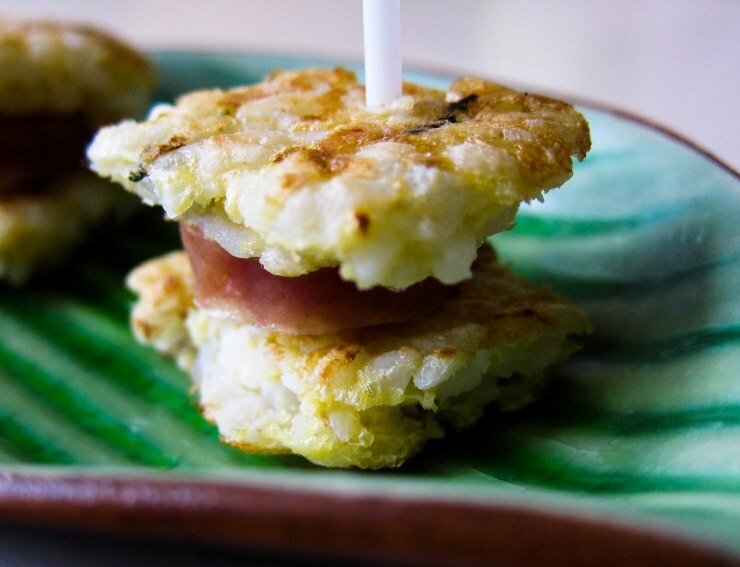 appetizing bite-sized finger food: part sandwich, part pintxo, part canapé. the hot dog buffet is on! Looks like a very tasty and novel pintxo. Yum. Love the interpretation, very clever. I bet they were yummy. I bought some Chinese sausages ages ago and never ended up using them! This would be such great finger food for parties! Mmm...I love lap cheong!! Great idea! This is so clever - I love the crispy little cake you serve them on! How inspired! I love them...and the chilis and the sausages are simply gorgeous! 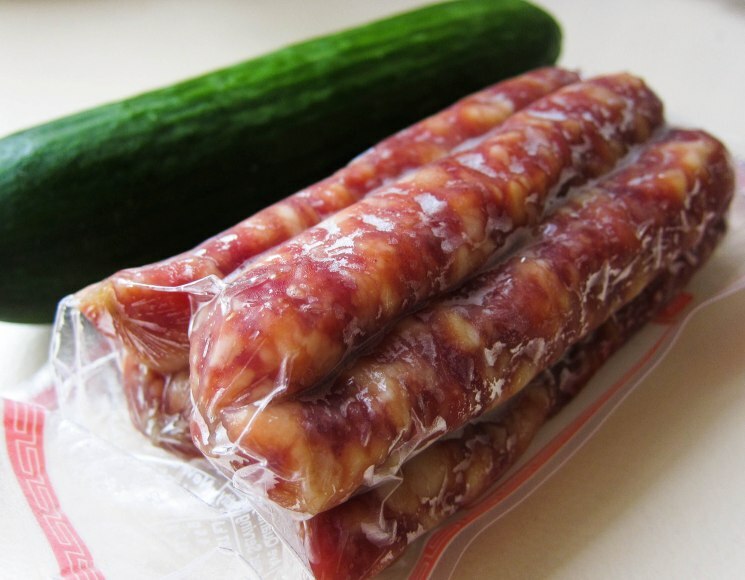 Am completely new to Chinese Sausages, need to try them. My goodness, I love the look of this! Gorgeous Asian flavours! I love your idea of the fried rice cakes. I've been to MOS Burger and can't believe I forgot about this. Most people wouldn't consider serving hot dogs as appetizers, but you've turned it into a perfect canapé with this creation! The crisp rice cakes are a perfect foil to the fatty goodness of Chinese sausages. Would love one or two of these right now..! Such a fantastic interpretation of the traditional hot dog! I go along with everybody here and give the thumbs up to your brilliant crispy rice cakes! I'm familiar with those sausages from sticky rice my mom used to make! Love them. I'd totally eat this! International incident party? I like that name. I also like hot dogs. Given that I like the name and that I like hot dogs, I think there's every indication I would totally dig these. And what makes a cucumber lebanese? Try the sausages Shirley - they may not be the healthiest thing in the world, but everything in moderation! Plus they're delicious. Abby, I think I know the sticky rice dish you are talking about (lo mai gai?)... yum! Totally creative to use crisp rice to make this special hot dog. I love it. Wow how creative and inspiring! I have yet to find a well-stocked asian shop here in ol Deutschland, but those sausages are worth looking a bit harder! Gosh, that's a really smart idea! I really like the use of lap chung, I was thinking about it for awhile too but decided not to go with it in the end, so glad you did! !